Did Kanye's 'Friend' Turn a NYFW Event Into a 6-Figure Fraud? Gold Digger? 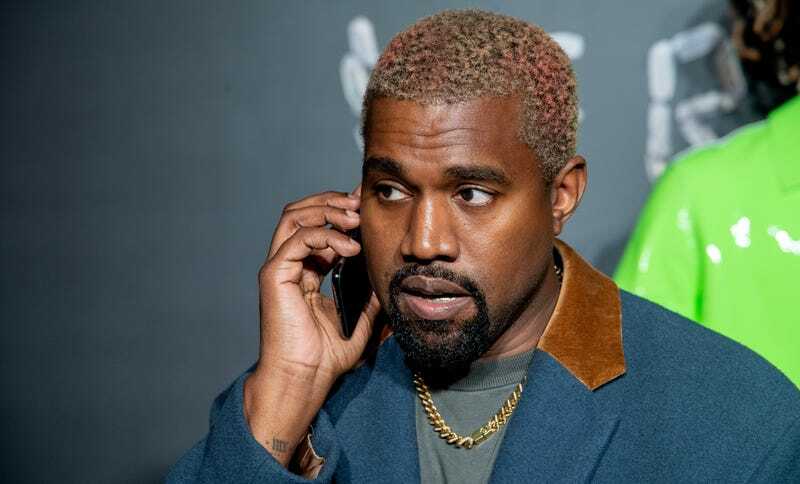 Did Kanye's 'Friend' Turn a Fashion Week Booking Into a 6-Figure Fraud? Kanye West attends the Versace Fall 2019 fashion show on December 02, 2018 in New York City. No one man should have all that power—and by “power,” we’re talking the ability to negotiate, book and collect hundreds of thousands of dollars in payment for a Kanye gig the entertainer didn’t even know about. That’s what TMZ and several other outlets reported happened this New York Fashion Week, when designer Philipp Plein contracted the rapper, producer and fellow designer to perform at his splashy 20th anniversary show on Monday night—or so he thought. Sources told TMZ that one of West’s associates reached out to to the brand, misrepresenting himself as a manager and negotiating for West to perform at Plein’s runway show, staged as a black-tie event with a three-course meal at the former site of New York City’s Four Seasons restaurant. The fee? Somewhere between $750,000 and over one million dollars, according to various reports. According to the contract, West was supposed to show up five hours ahead of time, walk the red carpet, attend the catwalk presentation, the cocktail party and the dinner. He was supposed to perform three songs with an orchestra and the deal called for Kanye to not wear any visible brands or logos other than Philip [sic] Plein — though he was allowed to wear Yeezys. The contract stated that Plein would pay $500,000 to the Donda Social Program Foundation and that six children from the foundation would appear at the event (dressed in a Philip [sic] Plein “total look”). They were also allowed a travel budget for Kanye, Yusef, an orchestra and the kids totaling $170,000. But believing they’d successfully booked West for their event, Plein’s camp promoted West’s upcoming performance on their invitations, one of which was obtained and reprinted by the New York Times. It would’ve been a fitting celebrity feature for the skull-laden, rock-and-roll lifestyle luxury label, which the Times reports has spent as much as $2.8 million for its over-the-top presentations, and has previously worked with problematic faves like Chris Brown, Tekashi69, Iggy Azealea and Azealia Banks. However, the bait-and-switch with West may now prove the most problematic of all. Less than a week before Monday night’s event, it became clear something was amiss when West’s wife, Kim Kardashian West, dismissed the announcement of his appearance as “Just a rumor,” via a tweet to her nearly 60 million followers. Plein’s camp did not comment on the alleged $900,000. So, what happened to the money? Malik Yusef issued his own official statement Monday night, denying any fraudulent activity and clarifying that the payments received were part of an ongoing deal intended to include t-shirts that would “fill the world with positivity” and a donation of $750,000 to Donda Social. Yusef also claims that when West became “incapulant”—by which we assume he meant West refused to capitulate to the terms of the deal for “unknown reasons,” the entirety of the money was returned to Plein. As further evidence of no wrongdoing, Yusef even mentioned looking forward to attending Monday’s event. No word on whether Yusef was still on Plein’s invite list—or attended the runway show, though we know West definitely didn’t. Nevertheless, the event went off without a hitch on Monday night, and as of the time of this post, no further comment has been given on whether Plein will be pursuing legal action against Yusef, Partlow, West, or any affiliated organization. But in perhaps the biggest irony of all, one of Plein’s most notable recent personal campaigns has been his fight against frauds.